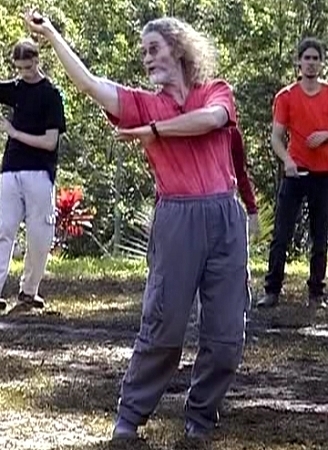 On this title, Erle shows and teaches the next two forms in the advanced knife fighting methods, those of "Bending Form" and "Fast Footwork Form". These two forms were taught at Erle's recent International workshop in Australia and all were in awe of the graceful movement and deadly application that these forms give. They also allow your brain to push out a balanced level of 'Fight or Flight' hormones/chemicals into the body so that the correct one will be chosen in any given situation etc. So if it's fight you must, then you will fight with the greatest amount of energy and aggression etc. Some very interesting techniques are shown within each of these forms.